UPDATE: See below for press coverage of #LawStrikesBack! At 1 PM (ET) on Friday, Feb. 17 (#F17), #LawStrikesBack! Lawyers, legal workers, law students, paralegals, court interpreters, investigators, social service advocates, and others who work in the courts will gather in front of courthouses across the country in coordination with the nationwide #GeneralStrike planned for the same day. This is an opportunity for the legal community to express our solidarity with the growing movements against the new regime and its white supremacist agenda. Engage your local community! Invite speakers, make signs, and share with your legal colleagues and allies! If your legal organization would like to co-sponsor this event, please email NLG Director of Research and Education Traci Yoder at traci@nlg.org. SPREAD THE WORD! 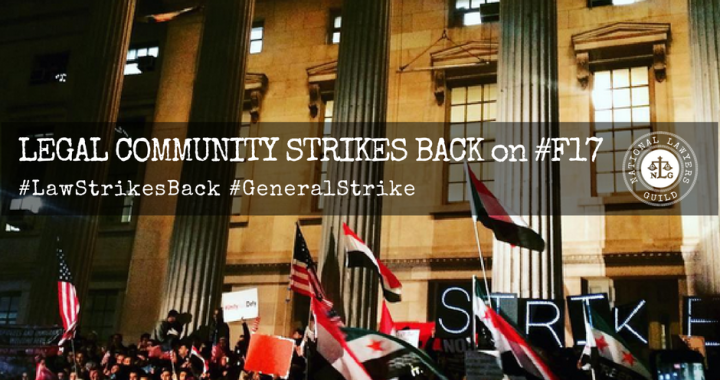 Use #LawStrikesBack along with #F17 and #GeneralStrike. Posted in Announcements and tagged Day of Action, Donald Trump, Protest, Strike.